When it comes to keeping my hair moisturized, certain styles work really for me and others not so much. Let me start off by giving my hair stats: type 4c (or tight kinks and massive shrinkage), medium (mostly) texture, normal to low porosity, and medium density. Now that the stats are out of the way, these hairstyle choices can hopefully make a bit more sense. Regular-sized twists are my number one go-to style for maintaining moisturized hair. Given a good deep conditioning session beforehand and the humidity (or lack thereof) outside, I can go up to 1-2 weeks before moisturizing again. When my hair does ultimately get dry, I usually replenish the moisture with a water-based spritz followed by my homemade shea butter mixture. Small to mini twists also work really well, but the takedown can be tedious, so I generally stick with my regular-sized or slightly bigger twists. If I want to wear my hair loose for longer, twist outs are generally better at retaining moisture than my wash n’ gos. I can wear one for 4-6 days before dryness sets in. However, I do not re-moisturize my twist out because it is typically after having had my hair in twists for a few weeks. (In other words, there is a bunch of shed hair just ready to tangle up upon touching water.) Instead, I just slap on some oil, detangle, wash, and go into my next style. My wash n’ gos require moisture every other day, if not daily, and via co-washing. Sure, it takes a long time for my hair to airdry, but once dry, my hair feels parched fairly sooner than in my twists. I actually rarely wear stretched updos because they are more high maintenance (for my hair) than simple twists or flat ironed tresses. However, when I do, they are probably the hardest to moisturize. This is because my hair will shrink up massively at the first touch of water in this state, which can lead to tangle city and headache. 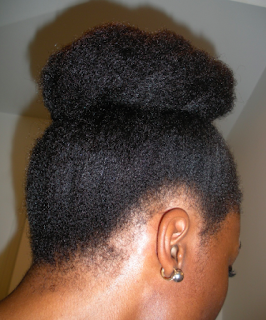 Stretched updos do not seem to retain enough moisture for me to choose them over twisted updos. That being said, I will usually wear a stretched style for just a few days before moving on to some other look.